Join us for a special program on the eve of the Preakness Stakes! Wear your derby or flowered hat, have a Black-Eyed Susan cocktail, and hear what’s been going on in horse racing, now and then, from expert Joe Clancy. The idea for Pimlico Race Course was born in 1868, during an elegant dinner party of wealthy sportsmen, including Maryland’s Governor, Oden Bowie. As they planned the Dinner Party Stakes, a horse race to commemorate the evening, the governor promised to build a new racetrack in his state to host it. 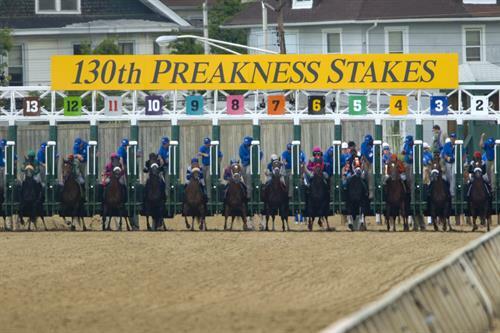 The winning horse of that first race in 1870, Preakness, became the name of the yearly competition. How does the second leg of the Triple Crown figure into the history of horse racing? What about the controversy over moving the race to the Laurel track? Joe Clancy is the owner, publisher, and editor of ST Publishing, the parent company of This Is Horse Racing, an online news magazine about the sport of horse racing. He has written for the New York Times and The Baltimore Sun, and has won awards for excellence in writing about Thoroughbred racing. Clancy’s articles have also appeared in the Saratoga Special, and the Mid-Atlantic Thoroughbred, among other publications. History Happy Hours include happy hour drinks and snacks. History Happy Hours are sponsored by Therrien Waddell Construction Group.